Do you get bored easily? Does time fly by for you, or does it always seem to drag? Is it easy for you to concentrate on activities, or do you often find your mind wandering? Is looking at a friend’s holiday photos your idea of a good time, or the tenth circle of Hell? According to a new study, which I conducted with Silan Eser, your answers to these kinds of questions can predict how strongly you believe conspiracy theories. We surveyed a hundred and fifty people, and we found that the more prone to boredom someone was, the more they tended to believe conspiracy theories. Why might this be the case? It’s not immediately obvious why being a little bored would have anything to do with believing theories about secret plots and sinister cabals. Boredom proneness, as a stable personality trait, is well-studied. Like any personality trait, some people are more prone to boredom than others. And people who get bored easily tend to experience a host of related unpleasant feelings, like anxiety and self-consciousness. More relevant to us, a study by Mitchell von Gemmingen and colleagues found that boredom proneness is also associated with feelings of paranoia. 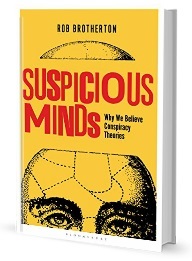 The link between paranoia and belief in conspiracy theories is nothing new. Just about every study of conspiracism that has included some measure of paranoia has found that the higher someone scores, the more likely they are to buy into conspiracy theories—which isn’t all that surprising. It makes sense that distrusting the people around you would make you wary of secret plots, and suspicious of so-called official stories. But paranoia is often overplayed as an explanation for belief in conspiracy theories. Most conspiracy theorists aren’t perpetually tormented by delusions that someone is out to get them. Most conspiracy theorists don’t wear tin foil hats. We’re talking about mild, everyday paranoia, like suspecting that people talk about you behind your back, or that a stranger on the subway shot you a mean look. Thoughts like these are perfectly normal; according to studies, many people have them on a regular basis. What our study suggests is that proneness to boredom—another perfectly ordinary trait—can predispose people to this kind of mild paranoia, which in turn can make conspiracy theories look more plausible. The important message to take from this is not that conspiracy theorists are pathologically paranoid, nor that they are prone to bouts of paralyzing boredom. On the contrary, it’s that we can all find ourselves twiddling our thumbs in boredom, and we can all find ourselves harboring the odd paranoid thought now and again. And we can all find ourselves drawn towards conspiracy theories, to some extent. Even if you don’t believe conspiracy theories, you have to admit they’re fun to think about. In a 2014 study, psychologists Eric Oliver and Thomas Wood pointed out that conspiracy theories, at heart, are good stories. They offer a compelling narrative, depicting a Manichean struggle between good and evil. There’s a reason conspiracies make such good plot-fodder for Hollywood blockbusters and best-selling novels: they are exciting. Our research fits with this view of conspiracism. One reason we like to contemplate sinister plots might be that they can help ease the boredom of ‘business as usual’. This entry was posted in Personality and tagged boredom, conspiracy theories, paranoia, personality, politics, psychology, research. Bookmark the permalink. If presented in fiction as an example of a standard reaction from conspiracy theorists, readers would think that the above comment was totally hyperbolic and outside of the realm of possibility. The work of fiction would be classified as a parody, not as realism. And yet, here that comment is, in the actual world. The “actual world”? Or the paradigm you have been indoctrinated into believing in as the actual world? You’ve never read Edward Bernays, PROPAGANDA? Never read Carroll Quigley’s, TRAGEDY & HOPE? All you know is Skeptical Inquirer and junk pseudo-psychology like propagated on this site. To whom Ophiuchus? In my view this site represents a conspiracy of psychological theories yet to be proven. Isn’t a latent and general, omnidirectional paranoia hard to determine in this post-Snowden, post Echelon world? I get bored, of conspiracy theorists spraying their cack on the internet. I am a conspiracy theorist, and I am very easily entertained. I am always entertained, because I am always thinking something through. Lock me up in a dull cell, and I will end up thinking about something. By constantly thinking I turned into a conspiracy theorist at first believing I would find a few small truths. I have since become a firm believer in the new world order. That is how I became a conspiracy theorist. Great reply Matthew! What these psychology theorists do not grasp is the role of curiosity as a factor of high intelligence.Yes, once you begin digging the new world order becomes an obvious fact of life. Bored reading ignorant attacks on people who actually use their brain for independent thought.